As a reaction to changes in customer behaviour thanks to digitisation, Deutsche Bank is putting its faith in a novel omnichannel consulting approach. With seven ‘Regional Advisory Center’, customers are offered more convenience, improved accessibility and greater flexibility – through high-quality audio and visual consulting, and in future also via chat functions. This is combined with an attractive working environment for the employees. The central element of every Advisory Center is the ‘Connecting Core’: a room element that runs through the office like a ribbon. Various modules such as meeting rooms, separated individual offices, seating areas to exchange thoughts, a cafe bar and areas for printers are integrated into it and arranged to suit each space individually. 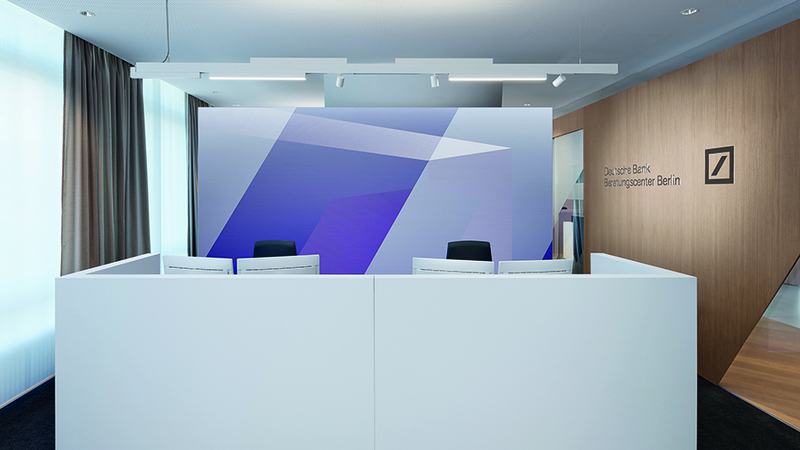 The ‘Connecting Core’ defines two functional areas: in ‘Customer Advisory’ shared-desk workspaces with rear video walls are installed. The ‘Social Hub’ offers employees the possibility of conversing and recuperating in an inspiring atmosphere. The modular room concept and the design form a corporate architecture that characterises the image of the consulting centres at all locations.